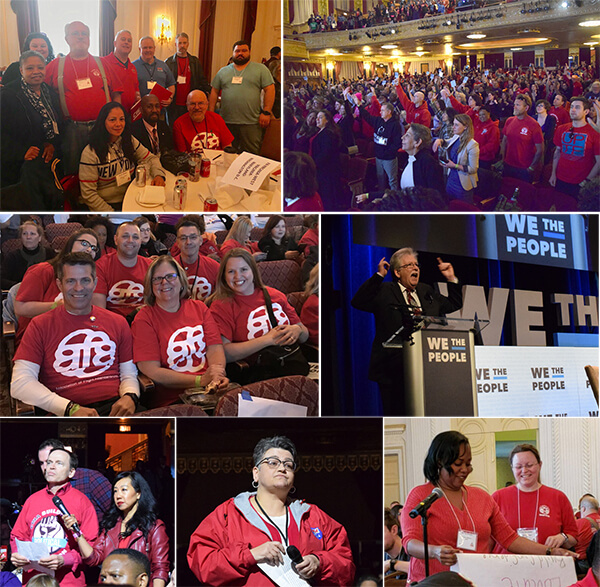 CWA members from across the country this week attended the We the People membership summit, a gathering in Washington, D.C., of progressive organizations focusing on strategies to fight back against attacks on our democracy that aim to limit the participation of working people. As part of the summit, eight Democratic presidential hopefuls answered questions from members of the organizations. The candidates participating included U.S. Senators Cory Booker, Kirsten Gillibrand, Amy Klobuchar, Bernie Sanders, Elizabeth Warren, Governor Jay Inslee, and Reps. Julián Castro and Beto O’Rourke. CWA Local 1014 Vice President Amber Pallante, who works for the City of Camden, N.J., talked about how the Supreme Court's recent Janus decision, a direct attack on public sector unions engineered by big corporations and right-wing extremists, illustrates the need for reform of our judicial system. "The Janus decision resulted from decades of right-wing plotting to use the courts to weaken the power of working people," Pallante said. She asked candidates to lay out how they would reclaim the judicial system for the people. Cherie Terhark, a call center worker for federal contractor Maximus, which handles calls from people who need help with their Medicare or federal ACA health care plans, told the candidates about the challenges she and her coworkers have faced in Maximus workers' fight for a voice on the job. She asked candidates to lay out their plans to extend collective bargaining rights to all workers. "My co-workers and I are fed up, so we've been organizing with CWA," Terhark said. "We want some say in how we are treated. That's what a democracy is supposed to be about—having some rights at work and some control over how you are treated every day on the job. Like most workers who try to organize, we've faced an intense anti-union campaign from management." Joe Mayhew, a member of CWA Local 1103, called on the candidates to support the creation of a small donor public financing system for all federal elections. "In the current system, money from these bad corporate actors and those that profit from their actions is drowning our democracy," Mayhew said. "There is only one real solution—ending the system of elections being primarily financed by private campaign contributions." CWA members also participated in a day-long strategy session following the summit. They discussed the key issues facing working families and how CWA members and retirees can help elect candidates for local, state, and federal office who will address these issues. CWA members from across the country this week attended the We the People membership summit, a gathering in Washington, D.C., of progressive organizations focusing on strategies to fight back against attacks on our democracy that aim to limit the participation of working people. CWA members made their voices heard at the forum, asking candidates questions about how they would address issues of great importance to union members and working people.